I will be uploading signatures. When was the graduation date? Allow 2 weeks for graduation diploma plaque completion, especially during March-June. FREE Priority Mail USPS Shipping! 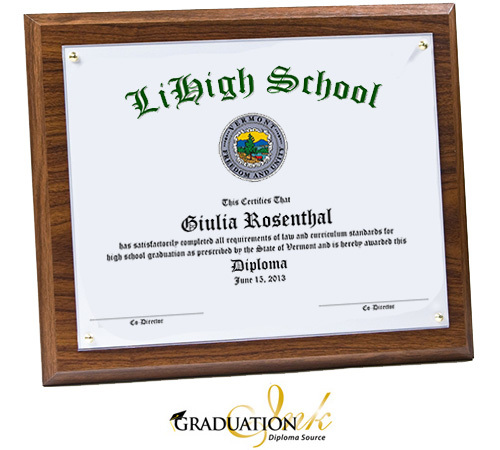 The graduation diploma plaque is mounted on a walnut style plaque. To prevent fading, we cover the diploma in a thin, 3 mil, ultraviolet (UV) protected laminate. The diploma is then secured with four attractive pins under a clear, plexiglass window. There is a notch on the back of the plaque to allow for wall hanging. The original diploma MUST have been printed by Graduation Ink. We can not change the format or text from the original diploma sheet. We will require a .jpeg, .pdf, .tif, .png, or some other file with the signatures so that we can insert them on the appropriate lines. (If you just want to scan a copy of your original diploma as a high quality .jpeg or .pdf, we can use this). To upload the signature files, simply click the button below. If you do not have the signatures that are required for the graduation diploma plaque, we can substitute a handwriting font if you desire.